The last home game of the 2018 seaon brought 4,600 people to the 700th anniversary stadium in the north of Chiang Mai, on the site of the 1995 SE Asian games. It was three times the average home crowd this season and just maybe the city is catching football fever. Much will depend on next week’s game at Khon Kaen and whether Chiang Mai are one of the three side promoted to the Thai premiership for the 2019 season. There are issues getting the crowds to the games. The stadium is a few miles to the north west of the city. You need transport to get there. The stadium appears to have had no money spend on it since the 1995 games. It is badly in need of renovation. Because it is a multi purpose stadium the crowd are separated from the match by a running track and other athletics facilities. The action is distant. Though this is true of most Thai stadiums. 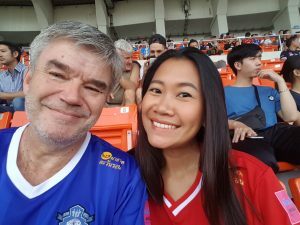 But there is something special about Thai football. The commitment of the players; the commitment of the fans. The parade around the ground after the game; win, draw or lose. The team and coaching staff standing while the crowd sings. This is their interaction – though I suspect many of the players might be happier in the showers and changing room. 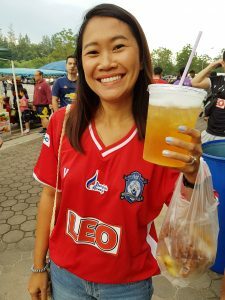 The catering – there is nothing in the ground – but an array of vendors outside the ground with beer, soft drinks and food. Where else can you buy deep fried quails eggs to eat during the game? And if you need a refill – get your hand stamped and pop out for a new purchase. The threatics. A goalkeeper (from Thai Honda) with cramp (he came on as a substitute) throwing himself to the ground. Warhorses like Khun Thossapol – victim of a dreadful late tackle yesterday – but still carrying on. The guy lives for his football. We all felt his pain as we watched him drag his body around the ground after the game. The Brazilian Soares walking around the pitch with his young daughter after the game. He barely had a sight of goal all game but he never stopped running. I wonder if he will be with Chiang Mai next season. I hope so. That thought is true for a number of the current team – there are a number of players on loan – mainly from Premiership Chiang Rai United – including Mustafa Azadzoy, Lenny, Juttajak, Saharat, Thanawit, Chotipat, Apirak, Woravong, and the young under 23 international Ekkanit. The Thai players often too wear their hearts on their sleeves, well they would if their shirts had sleeves. For them the game gets too emotional. Discipline is lost. There were at least 11 yellow cards yesterday. Too much protesting and not enough concentrating on the game. And frustratingly they over-elaborate. Sometimes simple is best. The big Korean forward wants an early ball into his feet as he makes his runs across the front line. He does not want to see a few square passes and then attack turned into defence as the ball is given away. The coach – the name is famous: but with a different middle name. 35 year old Brazilian, Carlos Eduardo Perreira. Nephew, I believe, of Carlos Alberto Perreira who remains the only manager to lead five different countries at a World Cup; the Brazilian guided his homeland to the title in 1994. Pereira was appointed in January 2018; for the season. Six to twelve month contracts are common in Thailand. It would be a shame if he is not back next season. He may have other offers of course. I assume it was Perreira that brought Soares and Verdini to the club. Both important players this season. Perriera is animated; enthusiastic and seems to work well with the Thai staff. He has created a team that appears fitter than most and battles until the end. The win at Lampang was a highlight. The 6-5 win away at Angthong was a defensive disaster but a glorious last minute win. Talking of warhorses – Khun Phichitphong, now 36 years old and a Thai football veteran is coming to the end of his career – but at times this season he has driven Chiang Mai forward. Capped 71 times for Thailand between 2002 and 2013 he is still a player with real class. He might make a fine coach. So if Chiang Mai win or draw next week at Khon Kaen they will be playing Premiership football next season. A higher standard, bigger crowds. Two other musts for Thai football; improving refereeing standards and improving player (and often coach) behaviour. Too much feigned injury; too much feigned outrage at decisions that do not go their way. Too much time spent trying to influence the referees. 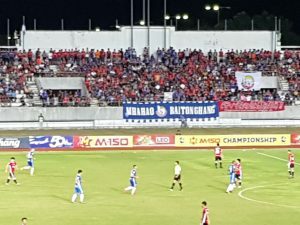 For Chiang Mai – and its large contingent of non Thai supporters. Maybe Thai and English announcements – at least of the teams before the game and substitutions during it. A massive overhaul of the official web site which is out of date and out of touch. Including bilingual match reports and match previews. Some pre-season visits and photo-ops in the community. Give out some match day tickets – the stadium has a 25,000 capacity – there is plenty of space. Make the fans welcome and get the fans involved – and the crowds will return.